Clever-stick Ben Marsh has gathered the mass of this data and mashed up a map to show how the snow is covering the UK. Well done Ben, in particular for getting it put together so quickly. ie: “#uksnow PO38 1/10 http://twitpic.com/aaaaa”. 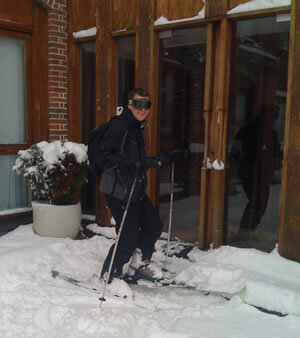 Here’s a giggle that came to us via Twitter, Brendan McLoughlin (@brenmcl, blog) in Aldershot, Hampshire tackled the snow falls and the difficulty of getting to work that comes with it, with a novel approach – by UK standards at least – Skiing there!